Hindsight is 20/20. Look back to read the story of your life – thus far! What milestones or markers distinguish your life? What impact did outer events have on your inner reality? And how has your inner reality affected outer relationships and circumstances? Reflecting on your life journey to date, you can get a deeper sense of who you are now and of the lessons you have been invited to learn. You may also get new perspectives on the gifts you have to offer the world. Stepping Stones has two parts: data gathering and then analysis. Have a look at a Life History Log form. First, pick a period of time. It may cover your whole lifetime. Or you may want to focus specifically on what happened over a shorter period, such as during a career, relationship or illness. The focus period should be at least 6 months long. 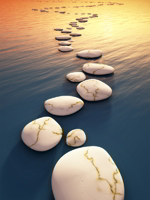 Next, within this time, identify your stepping stones – your key life events like birth, marriage, having children, job changes, divorce, health challenges, significant successes or accomplishments. Change the column titles to reflect whatever criteria seem important for you. Once the facts are gathered, reflect on the bigger picture of what’s happened. What perspectives come to mind? Are different events connected in any way? Have you repeatedly gone through cycles of one kind or another? What relationships have influenced your direction in life? There are an infinite number of angles to explore to fathom the unique mystery of your life story! Write down your thoughts as you intuitively identify themes or issues of concern over that period. List or write at greater length about shifts or changes that were spurred by or led to the major event milestones. Using the Life History Log plot the highlights of your whole life on a few pages. Record for each year from birth where you lived, what you did, your best friends, what car you drove, where you vacationed, etc. Create an organized audit trail of your life. Pick a relationship or a career. Identify the major milestones over that period and changes you observed. Write about your insights. Recall a dark time in your life. Perhaps you had difficulties regarding health, finances, work, relationships or family. Can you identify events prior to that time that may have set the stage for the issue to surface? What other significant events do you remember about this time? Write about your emotions and attitudes at each milestone. How did they contribute to or alleviate the distress? In hindsight, did the dark time prove to be a positive turning point in your life? If so, how? Reflect on and write down the major events of your lifetime. Which ones propelled you in directions you perceive as positive? Which ones seem to have diverted you from the path you’d most like to follow? 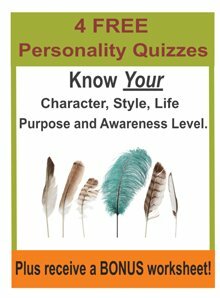 What qualities have characterized the various stages of your life? How can you bring more heart into what’s unfolding now? Check out our other many Write Your Life Story Resources.